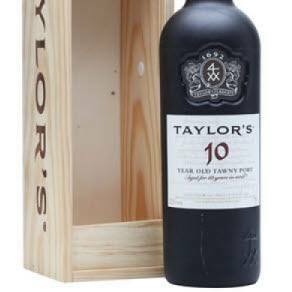 Taylor's 10 year old tawny Port wine packed in a gift box, the Port is with sweet, rich, chocolate-coated plum and cherry notes, a nice background of acids and tannin, and emerging nut and spice warmth into the long finish. Excellent. If this is a special gift you can pick the delivery date after you checkout. The NV 10 Year Old Tawny Port was bottled in 2014 with 105.23 grams per liter of residual sugar. Easily the 10 with the most weight in the Fladgate group's lineup this issue, it is a rather powerful 10 year old Tawny with plenty of pop, the biggest and baddest of the trio (Fonseca, Croft and this). There is very fine concentration of flavor for a 10 year old Tawny. If I had a quibble, the alcohol shows at times, especially early on and rather notably when drunk a little too warm. (Around 60 degrees Fahrenheit is a lot better than room temperature most of the time, to be sure, not just here.) Overall, the weight, complexity, mouth feel and grip on the finish still make this my favorite of the group of 10s submitted by Taylor Fladgate this issue, although it's close and there are some pros and cons. This comes with a bar top cork, i.e., not intended to be aged (although it most certainly can hold a couple of decades barring cork failures). Taylor’s blends its magnificent 10 year old tawny from its extensive reserves of old cask aged Ports matured in the firm’s cool and tranquil cellars (known as ‘lodges’) in Oporto on Portugal’s Atlantic coast. Taylor’s 10 Year Old Tawny is a superb example of the aged tawny style. Mellow and elegant, combining delicate wood notes with rich aromas of mature fruit, it is bottled for immediate drinking.